Some modules are actually integrated within the core or basic modules, for example, the Landed Cost module will appear embedded within the standard Purchase Management module. Inventory Management contains all the information associated with a part. 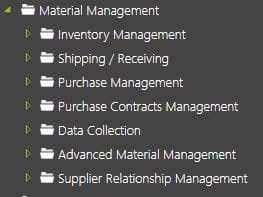 Before you can begin using this module you must define each part record, such as: the part’s unit of measure codes for inventory, selling, and purchasing transactions; whether or not you will be tracking part lot and/or serial numbers, manufactured or purchased, stock or non-stock, etc. The primary function of this module is to manage the flow of materials from incoming purchase orders (POs) through manufacturing and shipping to the customer. You can ship materials from stock or inventory, received to stock, or receive them directly to a job. Inventory transactions are made in the same manner regardless of the manufacturing environment, make-to-order (MTO) or make-to-stock (MTS). Ultimately, these transactions result in revenue and are posted to the general ledger (GL). Inventory Management – Specialized Processing builds on the basic inventory concepts introduced in the Inventory Management in order to build on the use of specialized inventory processing, including part cross referencing, material backflushing, lot/ serial number tracking and management of customer and supplier owned inventories. Define the difference between part, supply side, demand side and internal cross referencing. Create product code, internal, manufacturer, supplier and customer part cross-references. Understand how material blackflushing operates. Create and generate lot numbers for inventory tracking purposes. Establish serial number parameters and masking to standardize the serialization of parts. Perform Customer Managed Inventory (CMI), Supplier Managed Inventory (SMI) and consignment inventory processing. Set up and use the Min Max Safety Mass Update. Shipping and Receiving records incoming and outgoing part quantities. When performing either of these two processes you can record shipments against sales orders, subcontract job operations shipped to suppliers, parts received against purchase orders to a job or inventory, or to inventory for fulfillment of a sales order. You can ship parts from inventory or from a job. Parts typically shipped from a job are checked as Make Direct. You can optionally ship part quantities using either base legal numbers or modify these numbers to generate Serial Shipment Container Codes (SSCC). When you set up the format you want for either legal numbers or SSCC numbers, these values automatically generate on your shipments. Use these numbers to track the progress of your shipped items. Various pack out methods are available. Standard Pack Out is a method of shipping that uses a barcode scanner to record and track the packing flow. Use Master Pack Shipment Entry to combine separate pack IDs (master packs) into one master pack group to ship as one shipment. Phantom pack out functionality is available when you are using a manifest interface and provides the ability to generate multiple carrier labels for a single pack ID. Purchase Management and its more advanced module Supplier Relationship Management and the Purchase Contract module, all manage the creation of purchase orders and tracking supplier performance. The core functionality of these three modules is the Purchase Oder. Each purchase order (PO) can contain multiple detail lines, and each detail line indicates planned receipts to inventory, direct receipts to a sales order, or direct receipts to a manufacturing job. Purchase order receipt processing also updates suggested supplier and detailed purchase history files, so your purchasing history is continuously updated to help you make future purchasing decisions. Both contract and consolidated purchase orders (POs) can also be created through Purchase Order Entry. Through these additional module licenses, you create a contract PO with a specific supplier to purchase part quantities using a recurring, regular schedule. The contract PO is active throughout the purchase schedule as various receipt transactions are placed against it to satisfy the requirements of the contract. Consolidated purchase orders are global POs you can create to buy part quantities for all the companies within your organization. Each release on a consolidated PO can be designated for a selected company, Site, and warehouse, ensuring that the correct parts and quantities arrive where they are needed. With the Supplier Relationship Management (SRM) module, you can perform the request for quote (RFQ) functionality. Use this feature set to create request for quote records that you then send out to various competing suppliers. You evaluate the responses from these suppliers in order to decide which businesses can provide your company with the quantities, price points, and delivery dates you need for your manufacturing and servicing business flow. The RFQ information can then be reviewed through a central SRM tool, the Buyer Workbench. Through this tool, buyers can see the current state of their RFQs and purchase orders. All the entry programs involved in the purchasing process can be launched through this tool, including Purchase Order Entry, RFQ Entry, and various Suggestion programs. When you combine Purchase Management with the added SRM tools, purchase contracts, and multi-site functionality, you have complete control over your purchasing business flow. Consolidate multiple orders with multiple currencies into a single shipment. Apportion duties and indirect costs across shipment items. Track inventory losses between supplier shipment records and receiving records. Inquire part status across all shipments and locations. Define import tariff rates, percentages, and amounts to calculate duties for each received item. Use weight, value, volume, or quantity to disburse indirect costs to received items. Each indirect cost contains definable disburse methods. Buyer’s Workbench is for generating and managing requests for quotes (RFQs) and purchase orders from a central location within the Epicor application. Ability to review of all open and overdue RFQs – This allows you to view RFQs and provides access to RFQ Entry and Supplier Responses. Ability to review of all open and overdue purchase orders – This allows you to view purchase orders and provides access to Purchase Order Entry. A listing of all new RFQ suggestions that can be generated from jobs, new quotes, or methods of manufacturing (MOM). Ability to review new and changed purchase suggestions – The Approval sheet enables you to approve purchase orders that exceed a buyer’s authority (POs > Approvals sheet). This allows you to view purchase suggestions and provides access to Change PO Suggestions and New PO Suggestions. The Decision Wizard filters and sorts RFQs to find the best supplier match. The sorting criteria include lead time, quality rating, price, and user-defined attributes such as ISO certification.